Sometime in the late 70’s, our ladies started returning to the work force and we began to lose a little steam. This was the largest contributing factor in our slow down. In 1972 the addition to the Garden Center was completed. This is what we now call the Apartment and the Café’. Throughout the 70’s club members were very active and retired the Garden Center mortgage on the addition. In 2004, Hurricane Ivan took its toll on the property, felling many of the mature pine trees, including one that damaged the apartment. Repairs, removing trees and roof replacement were indeed expensive, and not all costs were covered by insurance. From 2011-2014 renovations were made to the lobby entrance auditorium, women’s and men’s bathrooms, and the Café. A new awning with lighting was installed over the Café. Windows and shutters were replaced on some of the smaller windows. From 2014-2015, upgrades to the office were accomplished. Improvements were made to the Native Garden and grounds with many new plantings added and mature plantings removed. Acoustical panels were added to the Cafe in 2016. Repairs to the gas piping, roofing and gutters were required in 2016-2017 to keep our home operational. The City of Pensacola assisted with the restriping of our shared parking and drainage issues on 9th Ave.
We celebrated our 85th Birthday with a tea. 1932 Three Clubs: Azalea, Crepe Myrtle, and Camellia joined Florida Federation of Garden Clubs. 1937 Florida Federation of Garden Clubs' Annual Convention held in Pensacola. 1940 PFGC has 16 clubs and 352 members. 1948 First Flower Show School held. 1949 Garden Center acquired at the foot of Pensacola Bay Bridge; the first Camellia issued. 1954 Garden Center Building Fund established. 1955 PFGC now has 36 clubs. 1957 Spring Flower Show in conjunction with Art Exhibit at Art Center. 1958 Blue Star Memorial Marker placed on US 90 at FL/AL State Line; Blanche Capel Covington Award given to Van Blanchard at FFGC State Convention. 1959 "Florida the Floral Way" was theme for the first State Flower Show held in Pensacola. 1960 Patio Tour of Homes held. 1961 New Garden Center authorized; Greenwood Square leased; PFGC named Garden Club of the Year at State Convention. 1962 Groundbreaking for the Garden Center held Mar.29. Construction completed in August. Dedicated Sept. 23. Family Tree Plaque acquired to honor Charter Members. Plaque honoring Past Presidents established. 1963 "Day Dreams Come True", first Flower Show held in new building May 4-5. 1964 Joined Sears "HANDS" Program. 1965 Van Blanchard elected State President. 1966 Mortgage retired on Garden Center in December; final payment made by Azalea Club member, Mrs. Martha Edmundson; "Ring Those Bells" theme of the 40th State Convention held in Pensacola. 1967 Mortgage burning ceremony at Annual Meeting. 1968 Formal dedication of native Garden in April. 1969 Blue Star Marker placed at 17th and Gregory. 1970 First Flower Show at new fairgrounds on Mobile Highway; "The Children's Hour" title of show winning National Award; first Antique Show held. 1971 Placed 1st in Southeastern Region 'HANDS' contest. Bobbie Moffet receives Blanche Capel Covington Leadership Award at State Convention. 1972 New addition to Garden Center completed; 1st All Junior Flower Show held; "Women's Vanity" Flower Show chaired by Jean Stairs, won 1st place honors in both State and National conventions; first HANDS Coffee held. 1973 Blanch Capel Covington Leadership Award given to Edith Tompkins at State Convention. 1974 First Tree Exchange and Arbor Day program at Seville Square; dedication of PFGC sponsored Nature Trail at University of West Florida; Blue Star Marker dedicated on Scenic Highway. 1975 Roster of Honor established; the fund was initiated after more than $1,000 was given to PFGC in memory of Bobbi Moffet. PFGC named Garden Club of the Year at State Convention. Records of Heritage Oak Trees sales into archives. 1976 Mary Knepton honored at Action 76 Banquet for HANDS program; PFGC received plaque from Audubon Society for outstanding achievement in conservation and environmental protection; Van Blanchard named Florida Patriot by Gov. Rubin Askew. 1977 Mortgage retired on Garden Center addition; Bartram Trail marker at Seville Square (Bartram Park) dedicated. 1978 Held first "Green World Seminar" for elementary school teachers; first two day Horticulture Seminar for the general public. 1979 Concluded four-season identification of native plants for travelers guide; Wildflower Show held by High School Gardeners; All Youth Flower Show held at Christmas; first vocational Gardeners' Unit established "Pistils and Stamens". 1980 In-House printing of Yearbook and Camellia. 1981 Won 'HANDS' Southeastern Regional Award for the last time as program was terminated on the regional level; PFGC sponsored three Traveling Trophies for school participation in Keep America Beautiful Week. 1982 Held 50th Anniversary Tea in November; Gardener of the Year Award instituted for outstanding service to club and federation. 1983 "Wonderland that is Florida", theme of State Flower Show held at Pensacola Bayfront Auditorium April 15-16; added outside stairs and entrance to apartment; Cinny O'Donnell installed as District I Director. 1984 Relocated Scenic Highway Blue Star Marker to median at intersection of Garden and A Street. 1985 Leona Venettozzi installed as District I Director. 1986 PFGC held first series of Floral Design Study Courses at Garden Center. 1987 First Landscape Design Study Course held in Nov. PFGC received the Order of the Crape Myrtle Award designating us as a Crape Myrtle Crusader; Carolyn Whitmer installed as District I Director. 1988 Received silver tea service from Nosegay Garden Club. 1989 PGFC co-sponsored Water Conservation Seminar. 1990 Floral Gallery of Clubs featured at Fall Members Coffee; PGFC co-sponsors an art and floral design exhibition, "How our Garden Grows" with Quaside Art Gallery; clubs donate over $360 for wildflower seed to be planted by FDOT at selected I-10 and I-110 roadsides. 1991 Federation sponsored Flower Show Judges School. PFGC participated in Crape Myrtle Campaign promoting crape myrtle planting with the Telephone Pioneers and Gulf Power Co. Oleander Garden Club dedicated The Desert Storm Memorial Garden on the Naval Air Station. Carolyn Whitmer installed as President of Florida Landscape Critics Council at State Convention. 1992 Oleander Garden Club's Desert Storm Memorial Garden Project won three state awards and the NCSGC Elsie M. Cook Award for Landscape Design. Carolyn Whitmer won the Special Achievement Award for her publication of Memories of Grandmother's Gardens. 1993 Hosted State Judges Symposium. 1994 District I chaired the FFGC State Convention at San Destin Conference Center. 1995 New Federation sign placed at the corner of Avery & 9th Ave; Master Gardner Clinic added to Tree Sale; Horticulture Conference held. PFGC cookbook published. Cinny O'Donnell chaired State Flower Show in Orlando. 1996 The Garden Center entrance roof is redesigned; and the floral mural is added to what is now known as the 'Garden Café Cinny O'Donnell is awarded the Blanche Capel Covington Leadership Award at State Convention. 1997 The new Florida Welcome Center on I-10 is planted with Ashei magnolias and bulbs. PFGC hosts District I meeting. Grounds beautification begins. Cinny O' Donnell installed as President of the Florida Council of Nationally Accredited Flower Show Judges. Barbara Alcott installed as District I Director. 1998 Hosted 2nd District I Learning Extravaganza; 1st Emerald Coast Flower and Garden Festival held at Pensacola Junior College in celebration of their 50th Anniversary. The Flower Show School Series is started. Two benches installed in the Native Garden in memory of Lazy Daisy member Fe'White. A new Youth Gardeners Library section built in the Board Room/Library in honor of Van Blanchard by Althea Garden Club. 1999 Jasmine and Sassafras Garden Clubs chartered. Garden Center Educational Series created to present two seminars annually. Hosted FFGC Judges Spring Symposium. Established PFGC Endowed Scholarship in conjunction with PJC. Camille Dunaway installed as District I Director. 2000 1st Secret Gardens of the Emerald Coast Garden Tour, presents 12 gardens to the public. Newly created Junior Gardeners Club - Wildflowers, meets at Barineau Park School. 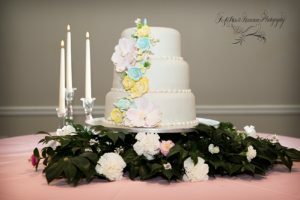 Gulf Coast Flower and Garden Festival held in conjunction with Pensacola Junior College Milton Campus and Milton Garden Club; all profits donated to PFGC, Inc. Endowed. Educational Series presented two seminars. The Café and Apartment are renovated. 2002 Sponsor two Education Series and two annual Fall Flower Shows at the Interstate Fair. Participated in St. Michael's Cemetery Live. At the State Convention, PFGC receives a 1st place award for the Garden Center. Clean and Green gave an award to PFGC for our continued work with the Campus Pride program. 2003 Ladybug Garden Club chartered. PFGC is active with landscaping Habitat for Humanity homes. Two Educational Series held in the fall and spring. Campus Pride trophies awarded to participating area schools. 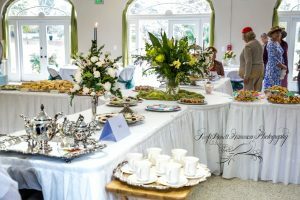 We participated in St. Michael's Live and we continue the Emerald Coast Garden Tour and our annual Tour of Tables event. 2004 The Veteran's Garden was dedicated at the Visitors Information Center with PFGC donating ten yellow roses. Honeysuckle Garden Club landscapes school grounds in Molino. Festival of Trees fundraiser initiated. Four Flower Shows, Garden Tour, Tour of Tables and two Educational Series conducted. The lighted sign in front of the Garden Center installed. 2005 Loropetalum Garden Club chartered. Clubs total 21. Hurricane Ivan (September 16th 2004) affects all of our lives, homes, gardens, The Garden Center and our annual events. Repairs include a new roof and back stairs to the apartment, new gutters, sprinkler system repairs and 28 pine trees removed from the grounds at a cost of $60,000. Cinny O'Donnell, installed as the First Vice President for the Florida Federation of Garden Clubs. The proceeds from the Memorial Day Standard Flower Show purchase a Blue Star Marker for the entrance to the Navy Base off Blue Angle Parkway. 2006 PFGC celebrates 75th Anniversary with special events including a special celebration at our annual Christmas Luncheon. 2010 A flower show, a District Meeting, the Fair . 2011 Our Circles were again active with a Rose show and Small Standard Flower show in the spring. We hosted another fall District Meeting. Members participated in the grounds clean up day. Our Circles raised money selling handcrafted merchandise and baked goods at a "Christmas in the City" collected baby for the food pantry, and sent goodie bags and floral arrangements to seniors. We hosted another Arbor Day with City of Pensacola Parks and Recreation, a Tour of Tables and A Garden Tour. 2012 PFGC embarked on a fundraising campaign for updating of the Auditorium beginning August of 2011 with sufficient monies available in February of 2012. to proceed with renovating the main Auditorium Building and upgrading the sewer lines. 2014 Sweet Bay dedicated a 'whimsey garden' in memory of Carolyn Whitmer. The 63rd Annual Fair Flowers shows had 900 entries. Poinciana disbanded after 50 years. Ann Crawford received FFGC Horticulture Leadership Award. Judy Keliher received the FFGC Pillar of Pride Award. Renovation of the Garden Center's restrooms occurred in the spring and the Café was restyled with new cabinets with granite countertops over the summer of 2014.